I've neglected to address an important point. Oversampling also opens up ultrasonic spectrum space for the SDM unit to relocate the quantization noise. The greater the oversampling ratio the more spectrum is opened and the less is the intrusion of the relocated noise in to the upper portion of the desired signal band. Without sufficient open (unused) spectrum the relocated quantization noise could significantly raise the signal band noise floor. The below link is to a nice graph on the dddac site that shows exactly that effect occurring. 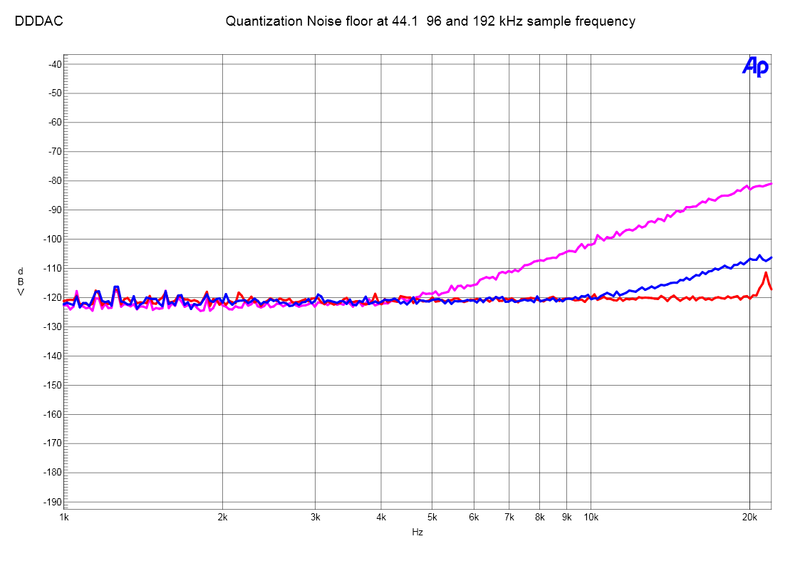 It shows a 40dB increase in the noise floor for a 44.1k sample rate by 20kHz, verus a 192k sample rate. I assume that the depicted sample rates are all without benefit of oversampling. Last edited by Ken Newton; 21st December 2016 at 02:30 PM. i don't see oversampling is something bad. on the contrary it's a good thing. IMHO the evil is in the filters. Oversampling is an integral aspect of the digital reconstruction filter's functioning. You're touching on a very controversial area here. Sampling requires band limiting the desired signal. Because CD supports only just enough spectrum to carry the audio band it requires sharply band limiting the desired signal. It is the sharp band limiting which produces the infamously ringing filter impulse response. While sampling theory is fully satisfied with sharp band limiting there is not universal agreement as to the affect on human subjective perception using dynamic signals such as music. there is not universal agreement as to the affect on human subjective perception using dynamic signals such as music. No, no, please feel free to open any cans you wish to. Use this forum to express your opinions, to ask questions and to share your findings. No one knows everything, although, I suspect that one or two of us here would like everyone else to believe that they do. My view is that we are all here to both learn and to teach, depending on the topic and the participants on a given thread. Last edited by Ken Newton; 23rd December 2016 at 01:29 AM.